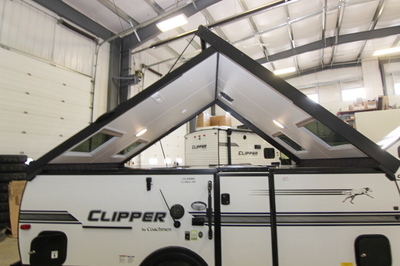 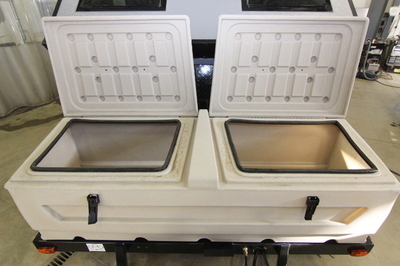 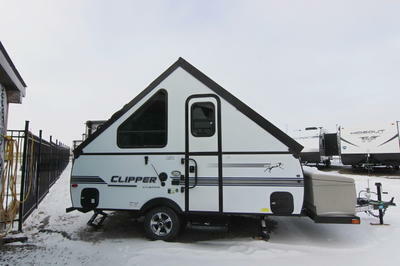 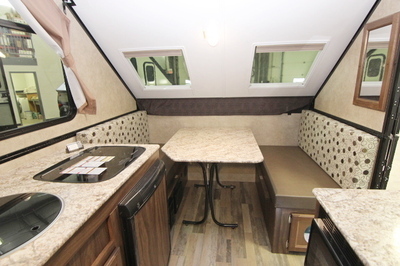 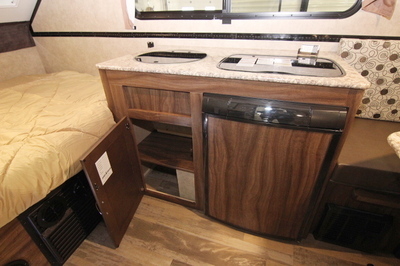 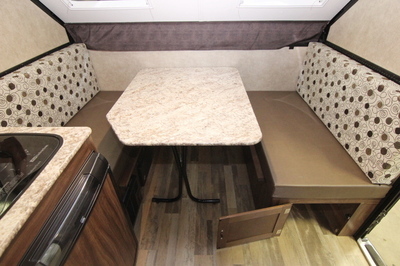 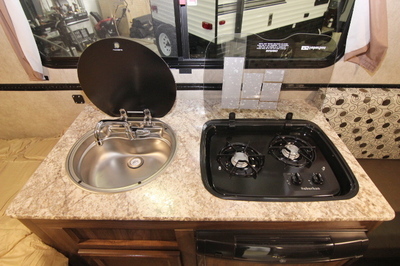 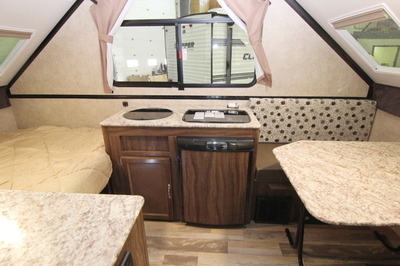 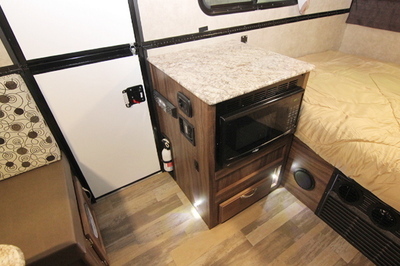 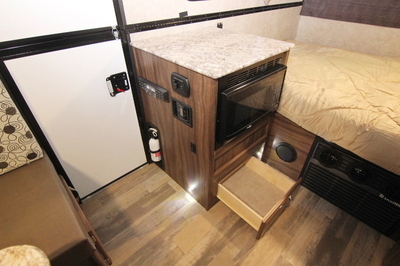 Unique "A" Frame Exterior with Electric Roof Assist, Booth Dinette, 1.9 Cu Ft Dometic Fridge. 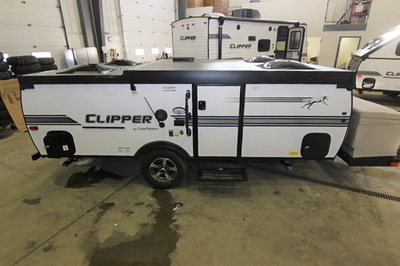 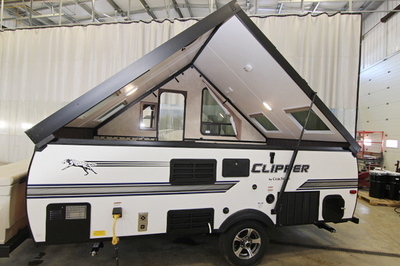 Standard Build:- Electric Brakes, Water Heater,AM/FM/Bluetooth Stereo with Exterior Speakers, Exterior Grill, Electric Roof Assist, White and Gray Fiberglass Exterior. 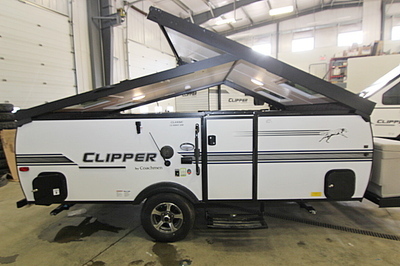 Chassis:- Tubular Steel Frame, Heavy Duty Dolly Jack with Wheel, Wide Trac Ultra Lube Torsion Axle, Electric Brakes, Radial Tires, Aluminum Rims, Scissor Style Jacks w/Pads(4). 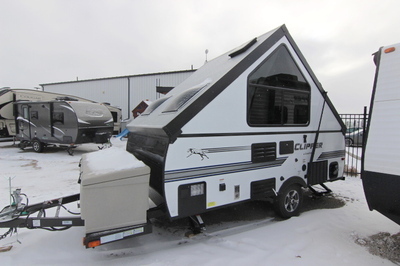 Exterior:- Laminated High Gloss Fiberglass Walls, Diamond Plate Front Wall Protection, One Piece Screen Door, Exterior Wall Mount LP Grill, 27 Gallon Below Floor Fresh Water Tank, 25 AMP Converter with Battery Charger, 120 Volt GFI Exterior Recept, Amber Patio Light, Removable Exterior Storage Box, Fan-tastic Power Roof Vent,Tinted Safety Glass Windows. 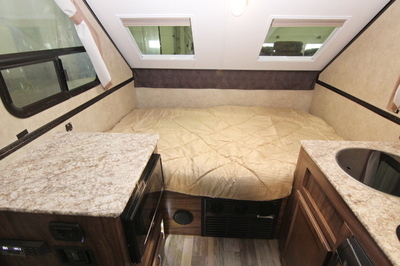 Interior:- 100% Adhesion Residential Grade Lino, Walnut Cabinetry, Mortise and Tenon Residential Cabinet Doors, Residential Laminated Countertops, High Density Serta Mattresses, Ultra Comfort 4” High Density Cushions, Vented Privacy Drapes, Microwave, Deep Bowl Acrylic Sink, 2 Burner High Output Range, 12 Volt On Demand Water Pump, DSI 6 Gallon Water Heater, 20,000 BTU Furnace, Dometic Cool Cat Air Conditioner, Skylights with Night Shades, 12 Volt LED Interior Lights, 120 Volt Interior Outlets, Retractable Clothes Bar, Jansen Bluetooth Stereo.